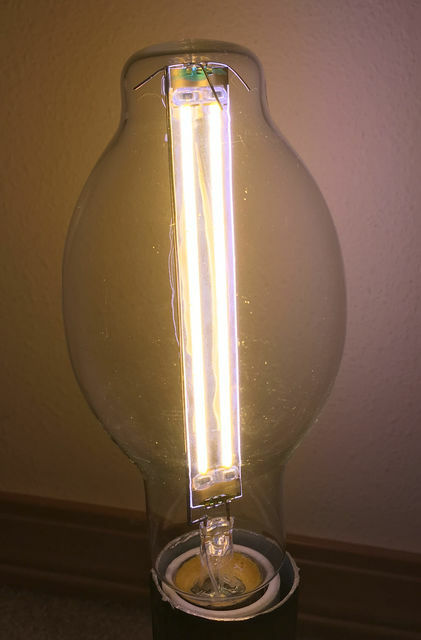 Here's a different kind of "retro" filament-type LED lamp. This one looks very much like a Sylvania standby HPS lamp, except it has a medium base. But both LED strips are set into what looks like a glass support, so perhaps it could be a mercury lamp. Which makes sense...because it really can't decide: The phosphor gives off a warm 2400K color closer to HPS, but the ends and edges emit blue unphosphored LED light...so it kind of looks like my clear SBMV lamp when lit. You can see some of this effect on the wall behind the lamp. Power factor is 0.6 and it is non-dimmable. the wall on the right side. I agree. Cool concept but odd lol. I wonder if the base cement would hold up if this was used base-up in a place like a bar or restaurant? With such a big glass on a medium base it might be a problem (certainly a large target to get bumped lol). I think there are some BT37 or even BT56 ones out there, aren't there? I'd love to see this applied with high-lumen lamps and mogul bases. Could make a decent retrofit for low wattage HID street lights if they made a 4000-10000L version. I also thought it was a standby HPS lamp! Is it actually more of an incandescent retrofit, or intended to replace a 35w HPS or something? I don't know it's intended use...I think novelty lighting. At under 800 lumens it's a far cry for replacing ANY HID lamp. However, I think eventually we will see filament LED HID replacement lamps with higher lumens and better quality light.